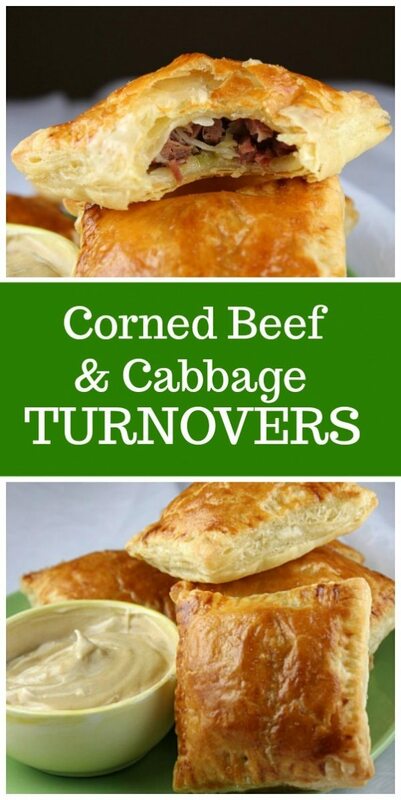 If you’re looking for recipes to make with leftover corned beef, these Corned Beef Cabbage Turnovers are the perfect recipe! 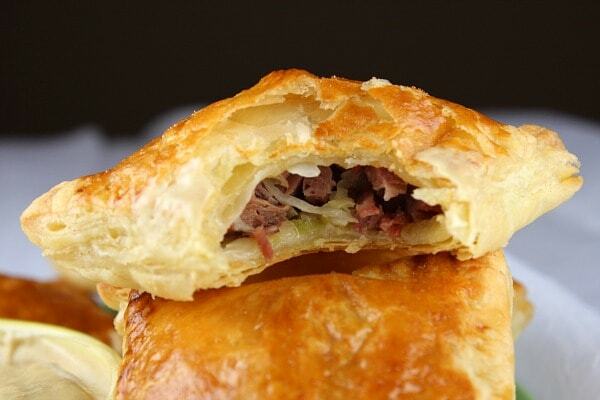 Corned beef and cabbage are baked inside puff pastry and served with a Dijon dipping sauce. What can you do with Leftover Corned Beef? 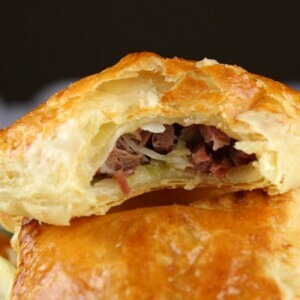 Should you have any corned beef left over from St. Patrick’s Day, do yourself a favor and make Corned Beef and Cabbage Turnovers. I always intend to serve them as an appetizer, but they are so filling that they turn out to be dinner instead. 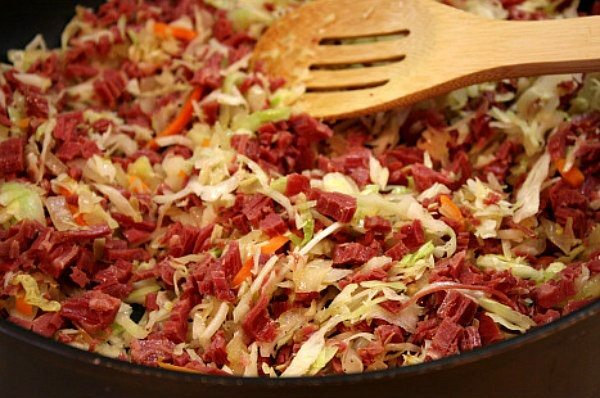 Saute chopped corned beef with a little onion and some coleslaw mix (or just plain shredded cabbage). Cut out 9 (2 3/4-inch) squares from two sheets of puff pastry. If you don’t have one of these fancy schmancy square cutters, just use a knife to cut them. 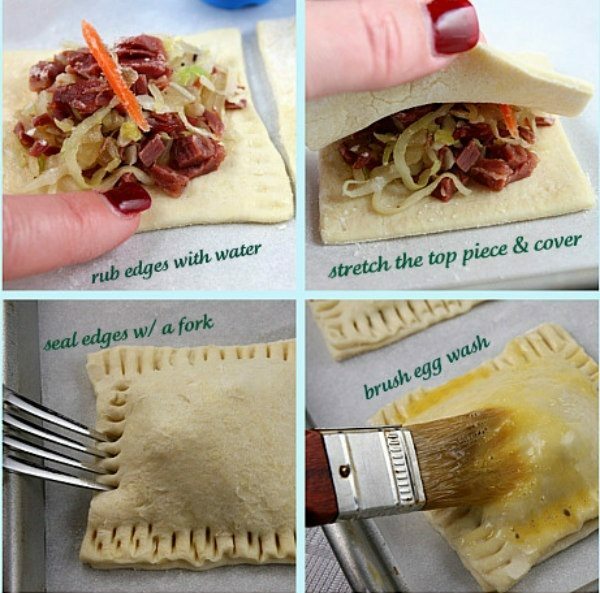 Put some filling on a square of puff pastry. Rub the edges with water. Stretch the top piece and cover. Brush an egg wash on top. Bake them up for 20 minutes, until they’re golden brown. Serve with mustard sauce- a simple mix of mayo and Dijon. Our family loves these. They make such an interesting heavy appetizer. If you’re looking for more recipes to make with leftover corned beef, you might like my Hot Reuben Dip, Reuben Bread, or Beer Puffs with Corned Beef Filling. What do you do with your leftover corned beef after St. Patrick's Day? 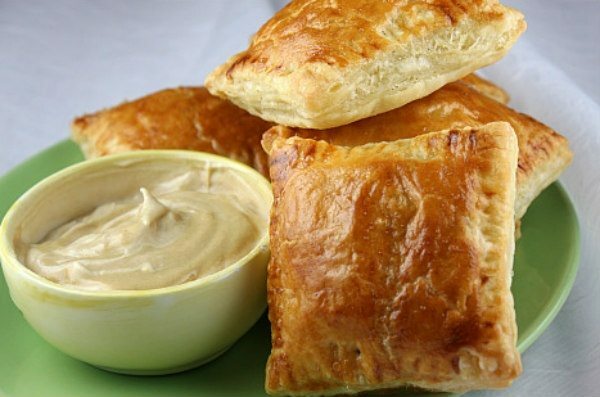 You should use it up to make some of these turnovers. We used them as heavy appetizers, which turned out to be dinner! In a large skillet, heat oil over medium heat. Add onion and sauté until translucent, stirring occasionally, about 5 minutes. Add coleslaw mix and sauté until mixture is wilted, stirring occasionally, about another 5 minutes. Stir in corned beef, salt and pepper and set aside. Let cool. Lightly flour a surface and rolling pin. Roll out thawed sheet of puff pastry to even out and seal seams. Cut out 9 (2 3/4 -inch) squares from each sheet. Scoop a rounded tablespoon of filling into the center of 9 puff pastry squares. Rub edges of each square with water. 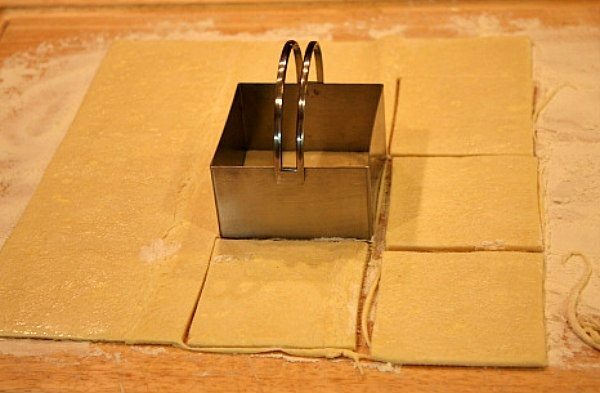 Place another square in your hands, stretch it slightly, and then place it on top of the filling to cover (like a ravioli). Use a fork to press the edges together and seal. Continue until all nine squares have been covered and sealed. Place filled turnovers onto a parchment-lined baking sheet. Brush tops with beaten egg. Bake about 20 minutes, or until golden brown. Let cool slightly, then serve with a mixture of 1/2 cup mayonnaise mixed with 2 tablespoons Dijon to make a mustard sauce dip. If you do not have leftover corned beef, you can always just pick up some corned beef in the deli and chop it up.